After seeing easy version of char siew filling from Wendy I can't wait to try! It is easy because the pork is cooked once instead of going through baking and grilling process. If char siew (BBQ pork) is meant for direct consumption do try Chinese Roasted Pork (Char Siew) which I posted sometiems ago. I like to use all-purpose flour instead of pau flour. The reason is it is cheaper (in where I stay now). With the help of some portion of low protein flour (cake flour), instant yeast and baking powder it produce soft buns just like pau flour did. Of course this is only my personal view. * I didn't divide into portions. I just take about a teaspoon of filling as I wrap the buns. 1. Put flour, sugar and yeast in mixing bowl. Pour in water and knead till form soft dough. Cover and rest for 1 hour or double its size. 2. 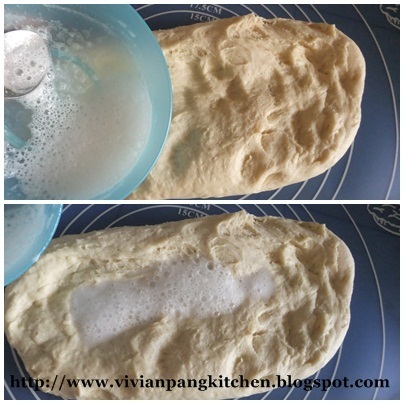 Transfer the dough on working surface, spread out the dough with hand. 3. Add double action baking powder and water in a small bowl. Stir with spoon and make sure is fully dissolved (only mix when about to use. Bubbles will appear as you stir). Pour the mixture on top of spreaded dough. Slightly knead till well combine. * kneading with hands is sufficient. 4. Divide the dough into 50g each. Wrap each portion with char siew filling and seal tight. Place on greased paper and leave to rest for 15-20 minutes. 5. Bring the water to boil. Steam the buns at medium-high heat for 10 minutes. When done leave steamed buns inside the steamer few minutes before open the lid. This coming weekend I will be back to my hometown visiting my parents. Therefore I won't be able to do posting or replying any queries. See you guys about a week times! Yummy Char Siew Pau! Your pleating of the pau is so nice. beautiful paus. Looks like those from the Dim Sum restaurant:)Have a good holiday. Actually is my little girl :) Thanks for the awards. Just look at those beautiful buns. Only in my dreams could mine ever turn out as beautiful as yours! Hope you are having a great weekend and thank you so much for sharing with Full Plate Thursday. Vivian, I love the photo of your little girl. She is a doll! Your pau looks like those I buy from our favorite dim sum place. I tried making pau some time ago but never make again after that because it was easier to go buy it. Now I see your post, I get itchy fingers and want to make it at home again. Thanks! It is not difficult as you thought. Do try and waiting for your steamed buns posts. Hi Vivian, your buns look marvellous. Would like to try your recipe. The problem is I always have problem measuring flour by volume. Would you be able to tell me how many gram is your 1 cup of flour, please??? Thanks! 1 cup flour is about 120g. As for the water/liquid will be about 1/2(or a bit more)to get the nice dough for steamed buns. Thanks for the entry Vivian! I remember so vividly when the ladies of the household turning out batches and batches of bao when I was little. Yummy paus! Your little girl is very cute! i think this is the first time seeing your little girl! very adorable and rosy cheeks too! If your yeast ok? Making steamed buns not like making bread which require knead till develop the flour gluten. Kneading with hand is alright as you can feel the texture..too hard add little bit more water.The pau dough should be soft when handle.I prefer my pau dough more on wet side as easy to handle. Or course not until too wet and sticky. Try again as practise make perfect! This is a good article and I loved the pictures. I have noticed the ultra-white nature of these buns which I attribute to its being bleached which probably lower's its nutrition value so I am glad to see you had good results with AP flour. I make Char Sui more freqently since I have discovered Kum Kee Char Siu Sauce which makes it fall off the log easy. Your Char Sui bun is a great idea. Hi Vivian, thanks for sharing the recipe. May I ask if all-purpose flour can be replaced by self-raising flour? Cheers. Should not be a problem substitute with self-raising flour. If so, omit the double action bp. Hi Vivian, read your post, you've made ready-to-eat and easy versions of char siew, which one taste better? for ready-to-eat version, u use malt sugar, is there any substitute for that? (e.g: corn syrup, honey..) Mickey. Both are equally good. I can't think of any substitution for malt sugar. 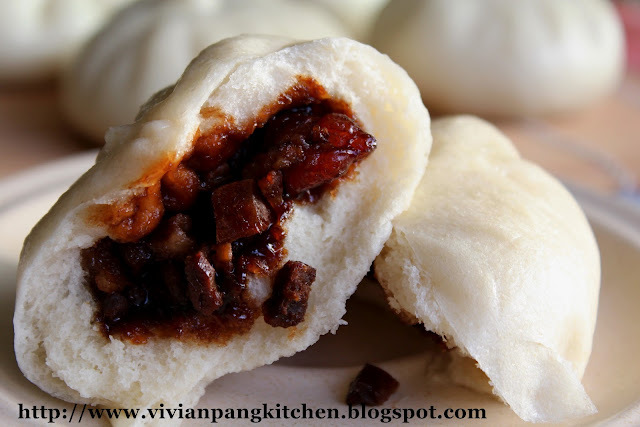 1 more question,I'd like to use this recipe & make a smiling char Siew bun, read from your other smiling char Siew bun post, u added ammonium bicarbonate, can I add it to this recipe? If yes, how many teaspoon? do I need to put kan Sui too? Thanks, Mickey. This recipe is using straight dough method with the used of yeast and double action baking powder as raising agent. Therefore no need to add in ammonium bicarbonate. turning into yellowish. Thank you so much for sharing the recipe, this is truly a recipe keeper :) Mickey. Good to hear that it turns out great. Thanks for the comments.